Over the holidays, we stayed on Ambergris Caye, a Belizean Caribbean island. It's essentially a long thin spit of sand, about 30 miles long, and only 4 blocks wide, kind of like Fire Island. Unfortunately, my brand new SanDisk 8 gig card fizzled out after the trip, and we may have lost all our (above water) photos. Jason's trying various methods to recover them. 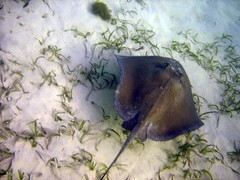 In the meantime, I'll just post my underwater photos from the trip, which were burned to CD on the island. It was nice to be in tropical climes during the US cold snap. Belize is an incredibly easy place to be, since almost everyone speaks English. It was part of the British empire until 1981 independence. People also speak Spanish and an English-based creole that I only understood a few words of. Ambergris Caye feels at once like Central America, South America, and the Caribbean. We stayed at a place called Ramon's, which has a style of decor I would call Mayan Tiki. Tiki style always comforts me. Our room was a freestanding little tiki hut with a thatched palm roof. The pool had a giant Mayan style head statue at one end which somewhat resembled Easter Island's maoi, and there were beautiful flowering plants and trees forming a garden maze between the various huts. Wandering around San Pedro, the only town on the Caye, the buildings were fairly simple; some were made of wind-worn board; others were painted in bright Caribbean hues. Most charming were the small cottages in colonial British cottage style. On the path along the windswept beach, friendly locals often greeted us. Some made offers of "good pot, good pot?" The food on Ambergris was lovely and fairly simple — very fresh fish prepared myriad ways, barbecue, Mexican cuisine. Johnny cakes are one surprise staple. We had jerk and coconut curry chicken at the Jerk Pit. At Wild Mangoes, one of the more innovative restaurants on the island, I had some delicious mini puffy tacos with smoked chicken and a fresh watermelon margarita. We enjoyed listening to the local radio stations. Hearing ads for a certain hardware store or clothing store on Punta Gorda (an entirely different location) emphasizes how small the country of 300,000 people really is. Playlists were eclectic, with Elvis, El de Barge, Marvin Gaye, and some song wondering "what the crazy monkey won't do." We were particularly startled to discover a song called "Backdoor Santa," which was in frequent rotation. 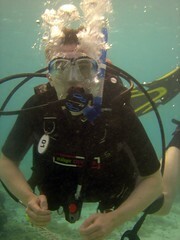 It was great to get back in the water and dive; it had been over a year. 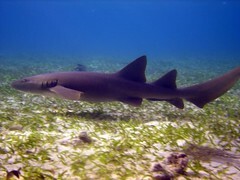 Belize has the second largest barrier reef in the world, second only to Australia's Great Barrier Reef. On one of the first dives, we saw some gorgeous spotted eagle rays, big and patterned. Morray eels the color of velvety emerald are common, and I saw one longer than my body and wider than my head, rippling through the water. 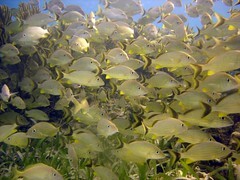 There were lots of schools of fish, plenty of blue tangs, and scores of other small fish. On my second dive, nurse sharks began swimming near us, so the divemaster brought out some bait to give them incentive to stay. I couldn't believe there were 8 beautiful sharks writhing around my feet. Their skin felt pebbly as they brushed against me. 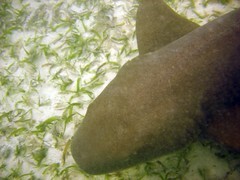 The nurse sharks were beautiful and seemed quite gentle. 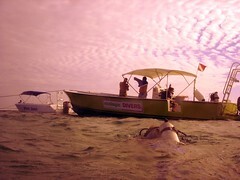 Though the diving was great, choppy water made entrances and exits a little tricky. 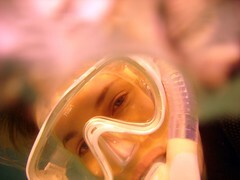 Most of the diving takes place outside the barrier reef. Our trip to Hol Chan marine reserve was easier, as it's inside the barrier reef. There, we saw many more sharks and rays. 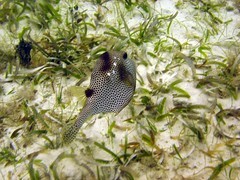 I chased this boxfish for a picture. 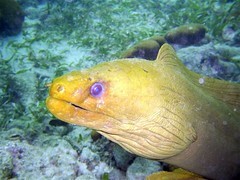 We found a big crab in a crevice, and saw a couple of eels, including one in a shallow cave. 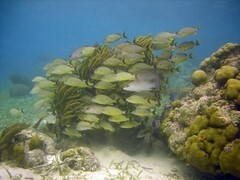 The area had lots of schools of fish hanging around big coral heads and antler coral. 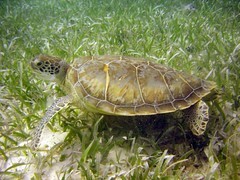 We saw two turtles on as well, munching seagrass. All in all, it was a great trip, till poor Jason got one of those awful cold/flu things that's going around. At least we got several great days of sun and diving in. We'd definitely go back. Awesome TV spot for Bodega Party in a Box! CW-11 aired a TV spot on the Bodega Party in a Box aired this morning. Check it out!